We have completely renovated this farmhouse to make it a place to our image simple and welcoming. It is located in the heart of the old farm, in a dead end, quiet, in the countryside. The cottage is attached to our home, it is comfortably equipped to accommodate 6 people. (3 bedrooms, 2 bathrooms). Between land and sea, it will be the ideal starting point to crisscross our beautiful region of Morbihan. Less than 15 minutes drive, you can already make beautiful discoveries: the small port of Saint-Goustan in Auray with its cobbled streets, stone bridge, half-timbered houses; the coastal paths of the rivers of Auray and Sal, and their varied heritage (chapel, tide mill, old Bono bridge). Then in the heart of the country of Auray the sea is never far: the Atlantic Ocean and its seaside resorts (Carnac, La Trinité sur Mer ...); the Gulf of Morbihan and its 42 islands and islands (Ile aux Moines, Ile d'Arz ...) and its landscapes of postcards are less than 30 minutes. You will also be able to discover the pretty city of Vannes and its flowered ramparts, its terraces on the port where it is good to let live; the Ria d'Etel and the picturesque island of St. Cado; the dunes of Erdeven not to mention the many megalithic sites that dot our region. It will take you 40-45 minutes to let yourself be seduced by the peninsula of Quiberon and its wild coast; Rhuys Peninsula and Suscinio Castle surrounded by marshes and woods with sea views; the city of Lorient and its city of sailing, its underwater base or the magnificent animal park, botanical and park at the end of Branféré. You can also go astray in the countryside a little further (1 hour) to stroll in the small city of character of Rochefort in the Earth and to admire its pretty shops, its stalls of craftsmen of arts or to discover the castle of Josselin or the forest of Brocéliande and its legends. Every place, rural, coastline, has its assets. You can stroll with family, friends, sail from island to island, hike or offer you a relaxing break on the sandy beaches or simply in our garden where we will be very happy to welcome you. très bon accueil ! belle maison très propre et bien équipée. Les hôtes sont très accueillants et chaleureux. La maison est idéal pour les familles. Emplacement au top! Maison avec beaucoup de goût et de confort. Bref un vrai bonheur. 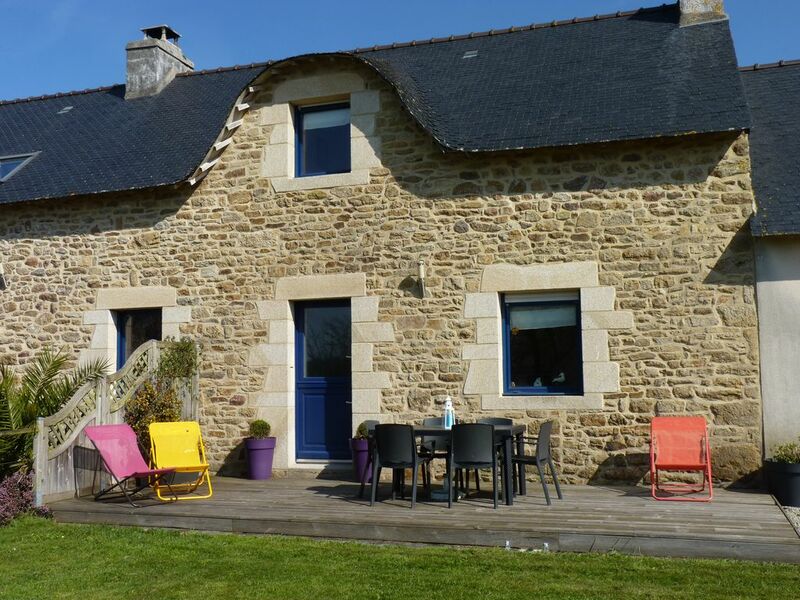 Un superbe gite, très bien agencé,avec sa déco cocooning. Je recommande vivement ce gite, un endroit calme. Gîte très bien équipé et très bien situé. Propriétaires très sympathiques et très à l'écoute. Je ne peux que recommander ce gîte. De très bonnes vacances dans cette région que nous apprécions. Accueil chalheureux et plein d'attention. Gîte très bien équipé avec une jolie décoration. Schönes Haüschen auf ehemaligem Bauernhof, gut ausgestattet und sehr schön dekoriert. Schönes Haüschen auf ehemaligem Bauernhof, gut ausgestattet, kinderfreundlich und sehr schön dekoriert. Sehr freundlicher Empfang der Besitzer, die uns nach unserer Ankunft zu Ihnen eingleaden haben. Gute Lage um die Umgebung zu Erkundigen.